VVC Exploration Corp (TSXV:VVC) is a resource company currently working to bring its flagship Samalayuca copper property in Chihuahua, Mexico to production. The NI 43-101 for the property was completed by Dr. Michel Boliy in 2013 represents an Inferred Mineral resource of 4.1 million tons of copper ore grading 0.47% copper and 5.8 g/t silver. This resource estimate was based on fresh rock samples from existing pits and from core drilling done by Phelps Dodge on the property and covers less than 10% of the mineralized zone. 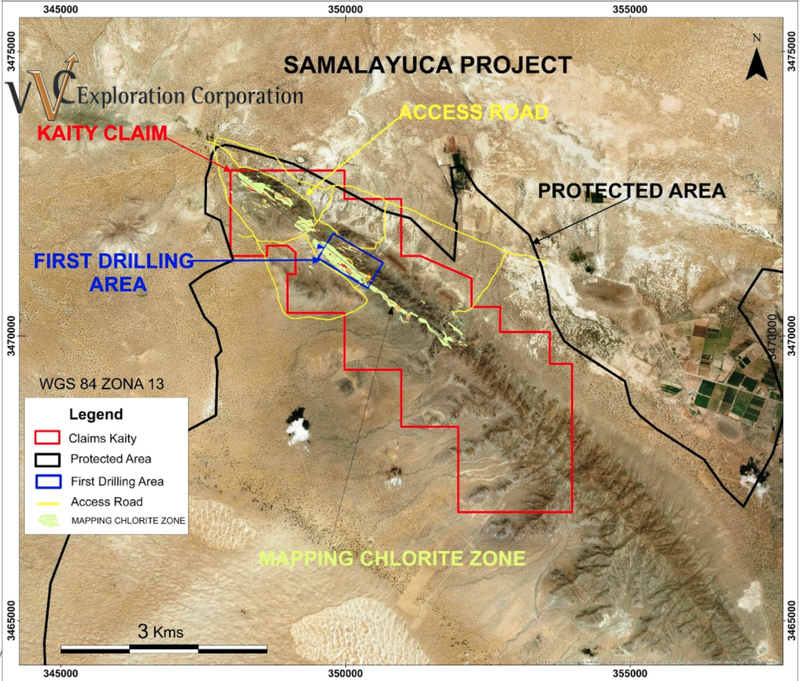 The Samalayuca copper project, is a 4,055-acre property situated in the northern part of Mexico’s Chihuahua state and 60 kilometers southwest of El Paso, Texas. A producing property up to its closure in 1970, the project is copper-bearing, sits in a region nearly devoid of vegetation and VVC is now looking to bring it back up to production as soon as 2018. The project is also supported by infrastructure including an access road, an available mining workforce. With the support of local government and landowners, VVC Exploration has played a role in this previously productive property since 2013, and has been working on obtaining the necessary permits to kick-off new production in the form of a pilot mine initiative targeted for 2018. VVC Exploration envisions that the revenue from this pilot mine will support exploration and pre-production activities across the rest of the 4,055-acre property as well as providing a healthy return for investors. The company also has an additional two wholly-owned properties in Mexico’s mining-friendly jurisdiction: Cumeral and La Tuna. Both projects are gold-bearing and are at different points in the exploration process. VVC’s Timmins Ontario, Canada project is a greenfield project and is the only Company project outside of Mexico. VVC is led by a management team with a wealth of mining experience and is supported by a board of directors with significant influence in both the mining and financial industries. The management and board are also notably invested in the company, with the CEO, and certain other members of management and the BOD are top investors. As a whole, the company has a tight share structure with over 90 million shares held by the top 25 investors. Flagship property in mining-friendly jurisdiction of Mexico supported by existing infrastructure and available workforce. VVC has been involved in the Samalayuca property since October 2013, when the company optioned 33.75 percent of the project and took on management control. In 2015, VVC then increased that option to 67.5 percent. By completing this form, you are giving consent to receive communication from VVC Exploration Corporation using the contact information you provide. And remember you can unsubscribe at any time. Historical activity on the mine includes detailed reconnaissance sampling in the previously mined regions of the mine in 2010 and detail and regional mapping and sampling in 2011. In 2013, a NI 43-101 resource estimate was completed, showing a resource of 4.1 million tons of copper ore, which represents approximately 42.5 million pounds of copper on just 10 percent of the property’s known mineralization zones. The company’s internal estimate is a 500 million pounds copper resource, at a minimum, with potential for significantly more. This estimate is an internal estimate base on exploration work of the Company and is not NI 43-101 compliant. Since 2015, VVC has been working on obtaining the required permits and approvals for launching the initial phase of production at Samalayuca. This has included obtaining zoning approvals from various bodies. Throughout this process, VVC has seen support from government officials and local land owners that see value in the development of the Samalayuca property. In February 2017, the company filed for drilling permit for 53 drilling sites which would help in developing a further geological understanding of the property and lead to an updated NI 43-101 resource estimate and help plan the anticipated Pilot mine. These permits were approved by SEMARNAT (Mexico’s Ministry of Environment) in May 2017 and VVC launched a 3,000-meter drilling program in late August 2017 alongside ongoing geological surveys. Moving forward, once they have obtained all of the relevant permitting, VVC will use their first phase of production to develop and run a pilot mine in the most promising of the previously-mined areas of the property. The pilot mine is expected to be built starting in 2018 and over a three to five year period provide the information needed for a complete mining plan (full feasibility study equivalent) while providing operating revenues for the company plus a return to investors. As the Samalayuca property is situated in an area that has minimal vegetation, the environmental mitigation costs will be minimal. And because the mineralization is near surface the cost of mining will be low. Additionally, as the mineralization shows oxide copper, it is relatively inexpensive to recover and VVC plans use low cost, low tech processing, producing copper cement that is directly usable in many industrial processes. The Cumeral project is a 16,622-acre property located in Northern Central Sonora, Mexico and 130 kilometers south of Tucson, Arizona. The property boasts a gold mineralization zone that runs at least 3.6 kilometers long. Early exploration on the property has outlined a non-resource descriptive only NI 43-101 which has been filed with the TSX. The initial exploration suggests that this property has all of the indications of a potentially very large gold resource that could be recovered in a relatively inexpensive manner through open-pit mining and heap-leach technology. 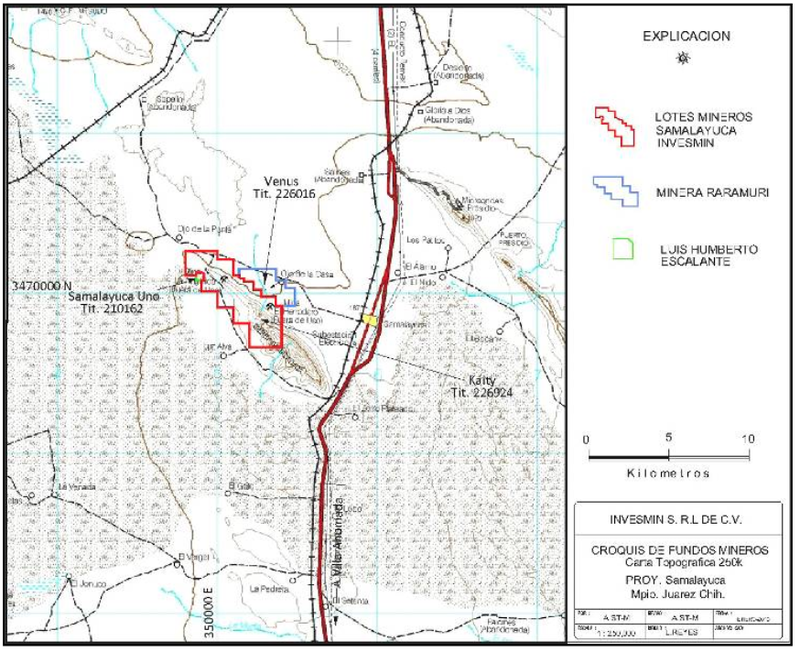 The La Tuna project is a wholly-owned 9,000-acre property located in Mexico’s Sinaloa state at the meeting point of the Rio Fuerte and Rio Baboyahui rivers. Located in a known mining region, the property is supported by infrastructure including reliable infrastructure. The property hosts two mineralized structures with potential for a gold/copper resource. Initial exploration on the property took place in 2013, suggesting the viability for an open-pit structure. VVC has signed a letter of intent with a mining company for the sale of the property. Due diligence is currently in progress. VVC’s Timmins property is located 48 kilometers southeast from Timmins, Ontario and 35 kilometers south of the junction of the Gibson Lake Road and Highway 101, accessible by the Gibson Lake Road and other bush roads. The property is a greenfield property where the only work has been a geophysical survey. James Culver has spent his nearly 40-year career in the fields of commodities, international trade and trade finance, holding posts in government, academia and the private sector. For the last 20 years he has focused on commodity finance and commodity project finance, primarily in mining and metals and agricultural products. He spent 22 years working in New York City where he most recently managed two private commodity asset based lending companies and developed hedge funds to support their lending activities. Previously, Culver served as Chief Economist and Director of the Economics and Education Division for the Commodity Futures Trading Commission where he was responsible for market surveillance and new product approvals. He also served for five years on the staff of the Committee on Agriculture of the US House of Representatives. In addition Culver has been an active participant in a family-owned and operated business for-profit educational services company. A Canadian mining engineer/geologist residing in Chihuahua, Mexico, Andre St-Michel has more than 30 years of experience in the mining business with a focus on mine development, mill operation, administration and finance. He currently serves as President and CEO of Freyja Resources. From 2003 to 2008, he was a senior executive of Dia Bras, responsible for its exploration programs and the startup of its Bolivar copper and zinc mine. Prior to 2003, he served as President of ECU Silver Mining, developing programs and properties in the US, Brazil and Mexico. He holds a degree from the Laval University Engineering School and a Master’s degree in Project Management from University du Quebec. Ms. King is a professional geologist specializing in building and leading multi-disciplinary teams to achieve clients’ high-priority objectives. She is Founder and CEO of Global Ventures Consulting (GV) a mining and natural resources consulting firm. She is also President of DZG, focused on partnering North American and Afghan capital to develop Afghanistan’s mining sector, and Senior Geological Advisor for SODEVCO, a chromite toll processing company. Prior to founding GV, Ms. King led the $40M/year mineral exploration, investment and promotional activities for an economic development task force in the US Department of Defense where she oversaw a team of 40+ experts. In that role she explored 15 mineral deposits throughout Afghanistan, promoting and tendering four early-stage copper and gold deposits in partnership with the Afghanistan Ministry of Mines and Petroleum, Afghanistan Geological Survey and the U.S. Geological Survey. Ms. King earned a degree in Geology from Bowdoin College, where she recently was a guest lecturer for the Earth and Oceanographic Science Department. She is Founder and active leader in Women in Mining: USA. Kevin Barnes has served as the corporate controller and CFO of various public and private companies over the last 12 years. He also served in the role of IT Manager and Senior Accountant with Duguay and Ringler Corporate Services, a firm which provides corporate accounting and secretarial services to publicly traded companies. He served as the Controller of Canada’s Choice Spring Water, one of Canada’s first publicly traded bottled water companies. He currently serves as CFO of Poet Technologies Inc, a pioneer in the field of integrated circuits and Controller of an international training institute with revenues of $100 million. Barnes received a computer operations diploma from Careers Development Institute and has a Certified Management Accountant designation from the ICMA Australia. Terrence Martell is the Director of the Weissman Center for International Business at Baruch College and the Saxe Distinguished Professor of Finance where he oversees a myriad of international education programs and projects. He is also the Chairperson of the University Faculty Senate and an ex-officio member of the Board of Trustees at The City University of New York. His area of expertise and research is international commodity markets. He is a Director of the Intercontinental Exchange (ICE) where he serves on the Audit Committee and has many roles. He serves on the Board of the Manhattan Chamber of Commerce and is a member of their Executive Committee. He is also a member of the New York City District Export Council of the US Department of Commerce and a member of the Reuters/Jefferies CRB Index Oversight Committee. Peter Dimmell is a geologist and prospector who has been involved in mineral exploration in Canada, the United States and overseas for 38 years. He is experienced in all aspects of the mining industry and has guided on-site operations from exploration through to production. He is a past president of the Prospectors and Developers Association of Canada (PDAC), a director and former chairman of the Newfoundland and Labrador Chamber of Mineral Resources and a councilor and member of the Geological Association of Canada. He sits on the Board of Directors of four other public companies: Arehada Mining Ltd, Linear Gold Corp, Pele Mountain Resources Inc and Silver Spruce Resources Inc, for which he also serves as CEO. Bruno Dumais is Vice President, Finance, for BroadSign International, a Montreal-based provider of digital signage solutions. He possesses over 20 years of experience in financial, forecast and strategic planning and is responsible for overseeing global financial activities. Prior to joining BroadSign, he was the Chief Financial Officer, Vice President of Finance and a Consultant at Mitec Telecom for seven years. He has also held senior level positions in companies crossing a variety of sectors, such as Gestion Exponent, Nortel Networks and Premier Tech. Dumais is a Chartered Professional Accountant and holds both a Bachelor in Business Administration from the University of Quebec in Rimouski and an International MBA from the University of Ottawa. Patrick Fernet is a legal, operations, and corporate governance expert with more than twelve years’ experience in Canadian small-cap public corporations. He serves as a consultant to VVC on a variety of corporate matters. He has more than 15 years of governance experience with small-cap Canadian corporations. Scott Hill has served as Chief Financial Officer of Intercontinental Exchange Inc (ICE) since May 2007. He is responsible for all aspects of ICE’s finance and accounting functions, treasury, tax, audit and controls, business development, human resources and investor relations. Hill also oversees ICE’s global clearing operations. Prior to joining ICE, Hill was Assistant Controller for Financial Forecasts and Measurements at IBM, where he oversaw worldwide financial performance and worked with all global business units and geographies. Hill began his career at IBM and held various accounting and financial positions in the US, Europe, and Japan, including Vice President and Controller of IBM Japan, and Assistant Controller, Financial Strategy and Budgets. *Disclaimer: The profile provides information which was sourced and approved by VVC Exploration Corp in order to help investors learn more about the company. VVC Exploration Corp is a client of the Investing News Network (INN). The company’s campaign fees pay for INN to create and update this profile page, to which links are placed on Investingnews.com and channel newsletters. What’s Driving the Copper Market?